September 3, 2010 - Delta Air Lines unveiled plans for the complete revitalization of its fleet of Boeing 747-400 aircraft flying primarily from the Tokyo-Narita hub. Between summer 2011 and 2012, Delta will equip each of its 16 747-400s with new fully horizontal flat-bed seats in the BusinessElite cabin and new Economy class seats featuring personal, on-demand entertainment, increased personal space and added under-seat storage. 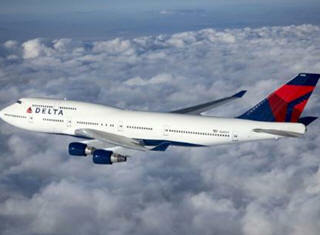 The investments are the latest in Delta's previously announced plan to invest more than $1 billion in enhanced global products and services through 2013. When complete, Delta will offer full flat-bed seats on more than 100 trans-oceanic aircraft, including all Boeing 777s, 767s and 747s, and will feature personal, in-seat entertainment for both BusinessElite and Economy class customers on all widebody flights. "The multimillion dollar investment we are making to completely revitalize our trans-oceanic fleet speaks to our strong commitment to the Asian market," Delta President Ed Bastian said in a press briefing here today. "While we have solidly positioned ourselves as the leading U.S. carrier across the Pacific in terms of flights and destinations, we are now taking steps to enhance the products and services offered across our Asian-Pacific network to position Delta as a leader in in-flight service." The 747 upgrades will bring substantial changes to both decks of the aircraft's BusinessElite cabin. The new, custom-designed product will feature 48 horizontal flat-bed seats with direct aisle access at each seat. Window seats will face the window for improved privacy and center seats will be angled toward each other for the convenience of customers traveling together. The new seat, manufactured by Weber Aircraft LLC, will be 81.7 inches in length and 20.5 inches wide, similar to the flat-bed product currently offered on Delta's 777-200LR fleet. It also will feature a 120-volt universal power outlet, USB port, personal LED reading lamp and Panasonic's 15.4 inch personal video monitors with instant access to 250 new and classic movies, premium programming from HBO and Showtime, video games and more than 4,000 digital music tracks. "The design of our flat-bed product meets customers' desire for comfortable sleep, direct aisle access and ample storage and work space when they travel on long-haul flights," Bastian said. "We have had great success from a customer service and business standpoint with flat-bed service since it first rolled out on our 777 fleet, and we expect similar results when customers experience our new trans-Pacific 747 and 767 BusinessElite product beginning next year." Customers in Economy class on the 747-400 will benefit from the industry's first seat designed collaboratively by a seat manufacturer and an in-flight entertainment company, Weber Aircraft and Panasonic Avionics Corporation, to fully incorporate seat and entertainment functionality into one product. Using a nine-inch screen, the new seat's embedded touch-screen entertainment system will offer each customer access to 250 movie titles, hundreds of television shows, 4,000 digital music tracks, personalized music playlists, more than a dozen interactive games and a USB port to charge iPods and other personal electronic devices. The new seats offer up to 1.5 inches more personal space and increased under-seat storage through a "slimline" design that more efficiently uses cabin space than the older, heavier seats they replace. The upgraded seats also feature adjustable headrests and deliver environmental benefits through the Panasonic Eco 9i Integrated Smart Monitors that use 30 percent less energy and are 60 percent lighter than entertainment systems installed on other Delta aircraft. Delta's 747s are dedicated largely to trans-Pacific and intra-Asia flights to and from the Tokyo-Narita hub, including routes connecting Tokyo to Detroit, Honolulu, Manila, Minneapolis/St. Paul, New York-JFK and Shanghai. When reconfigured, the 747s will accommodate 386 customers with 48 BusinessElite seats and 338 Economy class seats.